3D Ultra Minigolf Adventures Deluxe combines the 36 holes across three themes of 3D Ultra Minigolf Adventures (released December 20 2006) with the 18 holes of its expansion pack Lost Island (released July 25 2007) for a total of 54 holes. 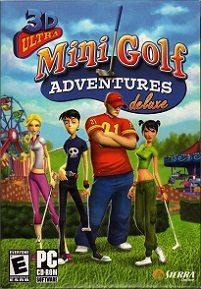 3D Ultra Minigolf Adventures was originally created in 2000, as a sequel to 3D Ultra Minigolf Deluxe, titled Mini Golf Maniacs for Microsoft Windows and PlayStation 2. In 2001, the Dynamix game division in charge of making the game was shut down and the game, while nearly finished, went unreleased for five years until Wanako Studios completed its development in 2006. The majority of the original game still exists in Minigolf Adventures, with graphical tweaks to the existing holes, replacement of the original animal characters with human players, and other hole additions.